This paper was written as part of the 2006 Alaska Oceans Sciences Bowl high school competition. The conclusions in this report are solely those of the student authors. Prince William Sound in the Gulf of Alaska is a diverse ecosystem, home to the world-renowned Pacific salmon run and the salmon shark, Lamna ditropis. The attempt at the Magnuson-Stevens Act reauthorization proposes the stimulation of undeveloped fisheries in order to boost economic revenue yielded from natural resources, including that of the salmon shark. Our concern is the effect of implementing a fishery of an apex predator species like the salmon shark on the ecosystem of the Prince William Sound area. First we suggest the continuation of the Alaska Shark Assessment Program and the Tagging of Pacific Pelagics (TOPP) studies in order to further understand the biological indicators that show how changes made to management of the salmon shark fishery are affecting the ecosystem. Although both programs are still young, we hope that they will bring accurate data to shark studies. Second, we suggest the implementation of the Individual Fishing Quota program in order to efficiently monitor the number of sharks extracted from the sound by newly developed fisheries. The climate of Prince William Sound is relatively mild for northern latitudes. Summer temperatures range from 4 oC to 18°C, while winter temperatures range from about 12°C to 3°C. Much of the eastern part of the sound lies in the rain shadow of the St. Elias and Chugach mountain ranges. The western part of the sound receives more precipitation because it is situated on a part of the mountain range that receives more moisture. The geography of the Prince William Sound environment is a relative haven compared to the neighboring areas. The slow carving of the Columbia Glacier produced the sound and the mountains surrounding it over the course of thousands of years (Lethcoe 1998). Much of the sound's landscape and bathymetry is due to glacial activity (Lethcoe 1998). Bathymetry is used to describe the topography of the ocean floor. The bathymetry of the floor of any body of water influences the flow of water in the area, which is affected largely by the different contours of the environment. Because of the difference in depth that occurs in the contours of the ocean floor, there are variations in temperature, salinity, and nutrient concentrations. Where a deep ocean current hits a relatively shallow continental shelf, the water is forced upward. This "upwelling" causes high concentrations of nutrients to be pushed towards the surface where fish, seabirds, and marine mammals can utilize it. Upwelling is what powers the marine food web for much of the diverse and abundant wildlife in Prince William Sound (USGS 2003). The organisms feeding in this area include many Pacific salmon and other prey species of the salmon shark. Communities on the shores of Prince William Sound include Cordova, Valdez, Whittier, and roughly a dozen islands. These communities depend on the revenue that commercial fishing in Prince William Sound provides (Prince William Sound Alaska 2005). Much of the employment available along the coast of the Prince William Sound is seasonal because so much of the economy is based on commercial fishing and some tourism as well. Valdez is the terminus of the Alyeska Pipeline and the largest port in the area. Valdez's population of 4,500 depends largely on bed and breakfasts, hotels, restaurants, and museums as services to the tourists who come to see the "Pink Salmon Capital of the World". This community holds a fishing derby every year that brings in money from fishing permits to support their economy (Chugach School District 2004). Valdez can be reached by road, railroad, boat, or plane, making it the most accessible of the three communities. Cordova is second in population (2,454 residents) and was established as a fishing community that depends on its canning and fish processing for income. Cordova can harbor up to 850 boats at a time. Whittier is a major access route from the Kenai Peninsula. Of its 182 residents, only 11 currently hold fishing permits, although its harbor can hold up to 344 vessels at a time (Lethcoe 1998). The number of boats the harbors can hold and the number that are currently there show a great potential for expansion in the fishing area. The fisheries surrounding its coasts influence the Alaskan economy. Alaska's seafood industry creates one fifth of all Alaskan jobs, and due to the charter and recreational fisheries, it is a dominant part of the state income (National Marine Fisheries Service 2001). Alaska accounted for 54 percent of the United State's commercial seafood harvest by weight in 2002. In contributing over half of the nation's harvest, Alaska is easily the largest U.S. fishery resource with twelve of the nation's top ninety-three ports, two of which are included in the top five (Blatchford April 2005). On average, 69 percent of the interviewed fishermen's income comes from commercial fishing. In the Prince William Sound area, 80 percent of the annual income comes from commercial fishing (Alaska Science Outreach October 14, 2004). 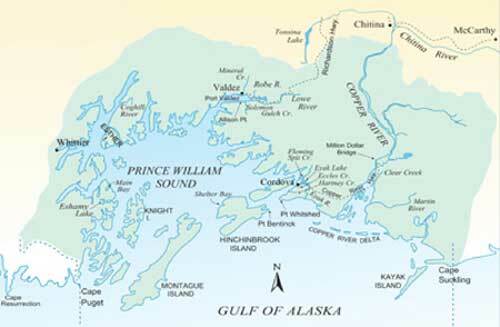 The Prince William Sound is more concerned with fisheries than the state as a whole. In 2004, over 28 million salmon were harvested from Prince William Sound waters. The estimated combined total of the commercial salmon harvest was $35.4 million. Individually, the gillnet fishery received $21.9 million, the purse seine catch was worth $5.7 million, and the hatchery revenue was $7.6 million (ADF&G – Division of Commercial Fisheries November 8, 2004). After understanding the fishing-based economy of Prince William Sound, we must examine the reasons why it may be advisable to stimulate a new fishery in the area. The Magnuson-Stevens Fisheries and Conservation Act was last reauthorized and amended by Congress in 1996, and reauthorization is currently being debated. After expiring in 1999, no attempt was made to formally reinstate its use until May 19, 2005. The act addresses bycatch, regional versus national standards, marine ecosystems management, and other fisheries management programs. The effect of the Magnuson Stevens Act will have on the Alaskan economy is enormous because of the state's major dependency on a fishing. The act proposes that underdeveloped fisheries in Alaska be tapped in order to maximize the benefits of our resources while relieving pressure from over fished species (Magnuson-Stevens Abstract May 19, 2005). The proposal includes the salmon shark in the Prince William Sound area. Our goal is to explore the effects of this fishery and establish a safe and efficient management program. Our primary concern regarding the Magnuson-Stevens Act is the shark fishery. The shark fishery in Prince William Sound will need to maximize the profit and product it receives from salmon shark catches. 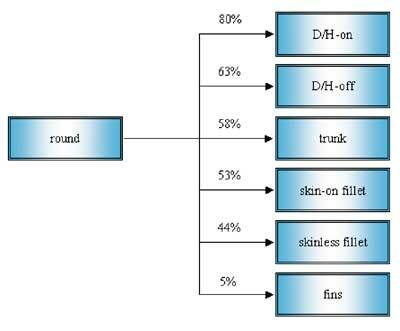 As shown in (Figure 2), fillets and finning are the least efficient forms of processing and, therefore, the least desirable preparation). If we maximize yield and profit, then there will be no need for wasteful over fishing. The salmon shark, Lamna ditropis (Figure 3), is part of the Lamnidae family, which includes the notorious Great White Shark. The Lamnidae family is known for their high-speed swimming abilities and their incredible predatory powers (Caroll 2005). The salmon shark has an extensive range, which includes the Pacific Ocean dominated by the California, Alaska, Kuroshio, and Oyashio currents (Paust and Smith 1986). Salmon sharks can be found in the North Pacific from Japan through the Bering Sea and Gulf of Alaska to southern California and Baja (Courtney et al. 2004). Information from the Tagging of Pacific Pelagics (TOPP), a satellite tracking system has documented of the range of salmon shark (Census of Marine Life 2005). (Figure 4) Salmon sharks are eurythermal, meaning they can withstand a relatively wide range of temperatures. They have been documented in waters that range from 9°C to 16°C but can be found in waters as warm as 18°C and as cold as 5°C (Goldman and Musick 2006). The salmon shark's range is quite extensive and is largely influenced by the ability to tolerate a wide range of temperatures, to regulate their body temperature (thermoregulation), their efficient swimming abilities, and their lack of predators. Water temperature is a major factor in the distribution of most fishes. However, sharks are endothermic and keep their body temperature above the surrounding water temperature (Paust and Smith 1986). In addition, salmon sharks have the highest body temperature of all sharks. The maximum difference between the shark's internal temperature and ambient water temperature has been documented at 21.2°C. The salmon shark is able to keep its body temperature at a relative constant regardless of changes in the surrounding temperature. They are able to accomplish this through a countercurrent heat exchange system called the "rete mirabile". The "rete mirabile" is part of the circulatory system and prevents heat from being dissipated by the circulating blood at the gills (Goldman et al. 2004). This system enables the salmon shark to occupy sub-arctic water and still swim at tremendous speeds. Proteins found in the hearts of salmon sharks have been found to also help enable the shark to deliver oxygen to the tissues in cold temperatures. Salmon sharks have been found to have excess SERCA2 and Ryanodine receptors, which are proteins key in maintaining heart beat and are generally found in hibernating animals. In the salmon shark these proteins help control the rate of contraction in the heart, aiding in survival and allowing them to thrive in arctic temperatures (Pennisi 2005). Salmon sharks are also known to travel through the thermocline, the narrow zone of rapid temperature change in the ocean, to survey prey available in the upper, the mixed layer, and the bottom layer. The lack of a swim bladder allows the salmon shark to make rapid ascents and descents with no ill effects from pressure changes. However, due to the absence of a swim bladder, the salmon shark must rely on hydrodynamic lift provided by the shape and positioning of its fins for buoyancy. For hydrodynamic lift to work the salmon shark must be swimming constantly. It is no wonder then that salmon sharks are terrific swimmers that have many physical adaptations to aid in this endeavor. The salmon shark's streamlined body, conical snout, homocercal tail fin, and large gills for gas exchange allow for efficient swimming. The shark's liver is also a major contributing organ for buoyancy in that it contains as much as 80% oil by weight and may account for as much as one-fourth of the total body weight of the shark, occupying the majority of the body cavity (Paust and Smith 1986). As oil is less dense than water, the liver is a tremendous contributor to the buoyancy of the shark, and therefore, its survival. The liver is also used to store energy that fuels reproduction and migration (Caroll 2005). Adult salmon sharks typically range from six to eight and a half feet in length. They usually weigh from 250 to 500 pounds but may weigh up to 600 pounds (O'Harra 2000). 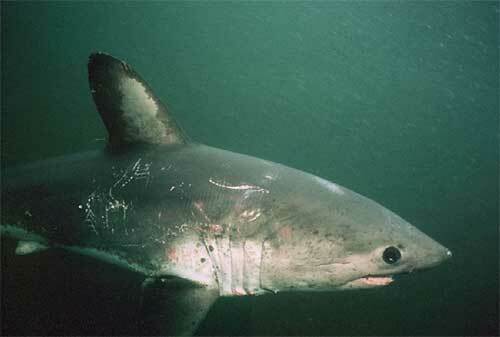 Salmon shark maturity is documented at 5 years for males and 8 to ten years for females. Gestation periods for the salmon shark are estimated to be around 9 months based on mating migration routes (Okey 1999). Migration for the salmon shark is ultimately dependent on the concentration of the available prey species. Many salmon sharks feed in the coastal waters of the Gulf of Alaska, in particular Prince William Sound, home to Pacific salmon spawning grounds. Some of these sharks rapidly migrate southeast towards the west coast of Canada and the US; however, some remain in Prince William Sound and the Gulf of Alaska during winter months despite the colder temperatures (Hulbert et al. 2005). While Pacific salmon species including silver, pink, red, king, and chum, are the predominant prey of the salmon shark from mid-July to mid-December, they are considered opportunistic feeders and euryphagous, feeding on a wide variety of prey (Hulbert 2001, Paust and Smith 1986). These foraging habits of the salmon shark may explain their varying migration routes (Hubert et al. 2005, Weng et al. 2005). Movement of the salmon shark is dependent partially on the quality and density of prey in a particular location as well as preference of mating and pupping locations. Although the majority of salmon shark stomach contents collected in the 1999-2001 Exxon Valdez Restoration Project were Pacific salmon, other organisms included squid, sablefish, Pacific herring, rockfish, eulachon, capelin, spiny dogfish, arrowtooth flounder, and codfishes (Hulbert et al. 2002). In the last fifteen years, it has been observed through the Alaska Shark Assessment Program that the abundance of salmon sharks in the north Pacific Ocean are the highest levels ever and appear to be on the rise (Wright et al. 2002). However, this is most likely an incorrect assessment as there are "aggregations of salmon sharks in certain places at certain times of the year, but they represent an increase in the local density, not an increase in the population size" (Goldman pers. comm.). The large aggregations of salmon sharks in certain areas of Prince William Sound may be attributed to the increase of bycatch dumping by trawling and the increase of large aggregations of pre-spawning salmon caused by the increased number of Alaska's hatchery programs, which began in the 1980's (Paust and Smith 1986, Wright et al. 2002). A warming trend in Alaska's oceans has been documented which has also been observed as a contributor to an improvement of groundfish production and Pacific salmon survival, both wild and farmed. In 1998, Alaskan salmon sharks consumed twelve to twenty-five percent of the total annual run of Pacific salmon in Prince William Sound, and fed on a number of commercially and ecologically important species. The sharks' existence especially in increased local densities has the potential to have a significant impact on the ecosystem (Wright et al. 2002). The increase in salmon shark prey species in certain areas of Prince William Sound has benefited the salmon shark and caused those areas to have greater localized densities of salmon shark. The heavy predation of Pacific salmon species by the salmon shark may be our best biological indicator as to whether changes in management of the salmon shark fishery are having a positive, negative, or neutral effect. To understand the true nature of the effect of a salmon shark fishery in Prince William Sound a thorough understanding of the relations the organism has with all other organisms in the Prince William Sound ecosystem is required. If a salmon shark fishery is to be implemented, it is these other organisms the salmon shark is connected to somewhere in the marine food web that may help indicate the effects of the fishery on the Prince William Sound ecosystem. Prince William Sound is characterized mostly as estuarine, as rain runoff, melting glaciers and icebergs, as well as numerous streams and rivers deposit freshwater into the sound. The combination of both fresh and salt water that make up the sound cause it to be inhabited by a variety of organisms that make up the marine food web of Prince William Sound. The food web begins with phytoplankton, the main source of primary production in the sound. The main components of this phytoplankton are diatoms and phytoflagellates, autotrophic organisms, meaning they can turn solar energy into chemical energy. This process, photosynthesis, cannot be performed without nutrients such as nitrogen, iron, and phosphorus. These nutrients are brought to the surface by upwelling. Upwelling is caused by wind patterns on the earth, and as these winds blow along the shore, the surface waters are pushed off shore, requiring deeper water to replace them. This deeper water brings the cold, nutrient-rich water to the surface, allowing phytoplankton to perform photosynthesis and provide the primary production that drives the food web (Gains 2005). The primary consumers in the food web are zooplankton, of which some examples are copepods, larval fishes, and jellyfish. These organisms feed on phytoplankton and therefore represent the first link in the food web. Benthic invertebrates such as clams and small epifauna such as barnacles and mussels represent the secondary consumers in the food web. Forage fishes such as Pacific herring, capelin, and eulachon feed on both primary consumers and secondary consumers, while larger fishes like Pollock, salmon, Pacific cod, halibut, and sablefish feed mostly on secondary consumers and can be considered tertiary consumers. Fourth level consumers (a trophic level above the tertiary consumers) pinnipeds, such as seals and sea lions and cetaceans, such as the Dall's porpoise. Fifth level consumers, constituting the top, or apex, predators in Prince William Sound are sharks (which include the salmon shark, sleeper shark, and spiny dogfish), and orcas. While the sharks will not be found feeding on fourth level consumers, they are considered apex predators because they are prey only to humans. Another discrepancy in the food web is that baleen whales are considered secondary consumers, feeding on primary producers, however they are not consumed by any other trophic level, but are not considered apex predators. Detritus is the final connection in the Prince William Sound food web, and is found in most other food webs. Detritus is particles of dead organic matter that is recycled into the web and becomes nutrients the primary producers need to function correctly (Okey 1999). If there appear to be obvious alterations in the food web after a potential salmon shark fishery is implemented, they may serve as biological indicators of the fishery itself. If the alterations are detrimental to the success of the ecosystem, the fishery must be put to an end. If there is to be any attempt to regulate an increased sport fishery of the salmon shark, the biology of the organism must be taken into account. Overfishing is a main concern due to the salmon sharks' slow maturity rate and low fecundity rates, with no more than four to five pups per every two year reproductive cycle. These characteristics need to be taken into account if there is to be any attempt to regulate an increased sport fishery in Prince William Sound and could be used as biological indicators that determine the success or failure of the fishery (Paust and Smith 1986). The Prince William Sound has many healthy fish populations. In the 2004 fishing season, a total of 28,084,952 fish were harvested commercially (Ashe 2005). This harvest was comprised mainly of salmon, a basic part of the salmon shark's diet (Roman n.d.). The demand for shark has been growing steadily worldwide since the 1940's and has increased greatly in the 1990's. The market's sudden boost came from the high value of shark-fin soup in Asian restaurants. One Chinese ship that was illegally shark fishing was found with 32 tons of shark fins alone (McLaughlin 2005). Other uses for sharks include liver oils for cosmetics and medicine, dried shark fin to eat, leather for shoes or belts, and shark jaws for souvenirs. Sharks have been fished for thousands of years. They have been fished in India, Indonesia, Pakistan, Taiwan, Mexico, Japan and the United States since the 1940's. Unfortunately, in most of these countries there is little management in place to regulate the shark fishing (McLaughlin 2005). It is clear that shark overfishing is out of control in these areas, and local governments sometimes do too little to regulate shark fisheries before the populations are severely impacted. Unlike the above-mentioned countries, southern Australia has a successful management program for their shark fisheries. They have a team comprised of biologists, shark population modelers, shark fishers, and an economist, all of whom are compiling an assessment of population trends in school sharks in relationship to the fishing trends (Punt 1998). They have found that although some shark species were much overfished in the late 1970s and 1980s, the population is healthy due to the management put in place by the Australian Fisheries Management Authority (Daley 2004). There are several communities off the coast of Prince William Sound that regularly fish for salmon shark, whether sport fishing or charter. Between Seward, Whittier, Valdez, and Cordova, there are about 30 charter boats that sport fish for shark. They practice mostly catch and release methods, although each fisherman may keep as many as one shark per day and two per year as allowed by Alaska state law (Horton 2005). We recommend the implementation of an Individual Fishing Quota (IFQ) in the Prince William Sound area for salmon sharks. The IFQ is a privilege granted by fisheries management organizations, which allows fishermen to catch a certain percentage of the annual run. The term used to describe the number from which this percentage is derived is the "allowable catch". The allowable catch is essentially a number or poundage of fish determined by population studies in order to fish the specific fishery only as much as it can healthfully sustain. The allowable catch is divided into shares and distributed amongst local fishermen (Fujita n.d.). These shares are generally allotted according to records of individual quotas from previous years (Groundfish 2005). If this solution were to be implemented, it is advisable that this method be avoided in favor of more equal shares that provide for both larger and smaller charter services. Some of the potential benefits of IFQ's include more flexibility for fishermen to adjust to regulations and market conditions, more economic certainty for fishermen, a more sustainable balance of supply and demand, and the ability to carefully monitor any changes in the salmon shark's behaviors and population. The most significant drawbacks observed in other fisheries where an IFQ system has been introduced are generally associated with the perceptions of the public and the imbalance of shares. These problems are easily addressed because in Prince William Sound, where the salmon shark fishery is still very limited, the implementation of an IFQ system could conceivably raise the amount of sharks in the annual allowable catch. The IFQ system assumes that there is an accurate estimate of salmon shark populations in Prince William Sound, which there is not. In order for any successful management of the salmon shark fishery, there must be more research done to better understand their life cycles and behavioral patterns (feeding habits). 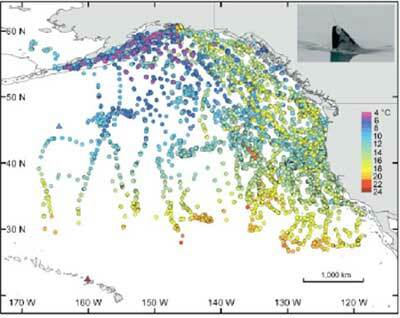 A computer model, called an "ecopath", estimates the impact of the complete removal of salmon sharks from the Prince William Sound (Figure 5). Our group recommends that more "ecopath" charts be utilized to better predict the impact salmon sharks exhibit on Prince William Sound; however, we realize that these charts are only as accurate as the data collected to produce them. 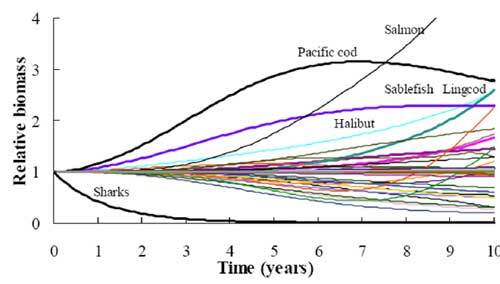 Figure 5 shows an explosion in salmon numbers and, therefore, points to them as our prime biological indicator (Fisheries Centre Research Reports 1999). Because the salmon increases that are naturally occurring are linked to temperature increases, we have concluded that temperature readings of the Prince William Sound and Gulf of Alaska can be used as a physical indicator for salmon shark populations. Although the salmon shark itself is not directly affected by differences in temperatures, prey species such as salmon are. The IFQ system has already been in place in Alaska for different communities and a different fishery. In the late 1980s and early 1990s, halibut populations in the southern Kenai Peninsula declined sharply, causing increased competition for poorer product. This created obvious concern in the fishing community, and the North Pacific Fishery Management Council recommended that the IFQ system be implemented to address these problems. The system became official in 1995; and since then, the fishing has been extended and residents have seen a remarkable increase in both product quality and safety at sea. Discard, bycatch, and lost gear have decreased dramatically. The following program outline, based on the Final Rule, as published in the Federal Register on April 30, 2004 (69 FR No. 84; 23681), provides a general idea of how an IFQ program could be adapted to a small community that the standard IFQ does not apply to (Figure 6). Any of the larger communities are addressed in the IFQ system that is being used for halibut and sablefish fisheries in towns including Whittier, Valdez, Cordova, and almost every other port in the Gulf of Alaska. We propose using this for the more populated areas in the Prince William Sound where it is already being applied (halibut and sablefish). Obviously, there are further considerations to be made based on the unique characteristics of each community. Setting limitations on the salmon shark fishery are again, almost exclusively dependent on further research and careful monitoring of populations if any changes are made, but the limitations are vital to this program. We suggest the continuation of monitoring studies like the Alaska Shark Assessment Program and TOPP. Because of the noticeable increases in halibut quality due to the implementation of the IFQ, we believe that this can be an efficient way of managing the proposed salmon shark fishery. If the government decides to stimulate the shark fishery, we would assume that funding will be come from agencies such as the Exxon Valdez Oil Spill (EVOS) Trustee Council and North Pacific Research Board (NPRB). The EVOS Trustee Council provided $169.5 million between 1992 and 2003 for research, monitoring, and general restoration. Also, the EVOS Trustee Council has a program known as Gulf of Alaska Ecosystem Monitoring and research (GEM) that monitors long-term ecosystem changes in the Gulf of Alaska, assesses resource partitioning, and predicts future changes. The GEM program receives approximately $5 million annually (Exxon Valdez Oil Spill Trustee Council 2004). The NPRB currently maintains the IFQ system in the Gulf of Alaska. The Research Board allocates approximately $5.9 million a year to research in the Northern Pacific region (North Pacific Research Board 2005). Blatchford, Edward. Alaska Economic Performance Report 2003. State of Alaska. Department of Community and Economic Development. April 2004. Courtney, D.L., S. Gaichas, J. Boldt, K.J. Goldman, and C. Tribuzio. 2004. Sharks in the Gulf of Alaska, Eastern Bering Sea, and Aleutian Islands. Appendix, pp. 1009-1074. In: Stock assessment and fishery evaluation report for the Bering Sea and Aleutian Islands. North Pacific Fishery Management Council, 605 W 4th Ave, Suite 306, Anchorage, AK 99501-2252. Goldman, Kenneth. Alaska Department of Fish and Game, 3298 Douglas Place, Homer, AK 99603, 907-235-8191. Goldman, K.J., S.D. Anderson, R.J. Latour and J.A. Musick. 2004. Homeothermy in adult salmon sharks, Lamna ditropis. Env. Biol. Fish. 71:403-411. Goldman, K.J. and J.A. Musick. In press. Biology and Ecology of the Salmon Shark, Lamna ditropis. In: Sharks of the Open Ocean. E.K. Pikitch and M. Camhi, eds.Blackwell Scientific, to be released 2006. Horton, Ron. Orca Bay Charters, PO Box 903, Cordova, AK 99574, 907-424-5777. Hulbert, L.B., A.M. Aires-Da-Silva, V.F. Gallucci and J.S. Rice. 2005. Seasonal foraging movements and migratory patterns of female Lamna ditropis tagged in Prince William Sound, Alaska. Journal of Fish Biology 67, 490-509. Lethcoe, J. and N. 1998. A Cruising Guide to Prince William Sound. Valdez: Prince William Sound Books. Okey, T.A. and D. Pauly (eds.). 1999. A trophic mass-balance model of Alaska's Prince William Sound ecosystem, for the post-spill period 1994-1996. Exxon Valdez Oil Spill Restoration Project Annual Report (Restoration Project 98330-1), Fisheries Centre, University of British Columbia, Vancouver, Canada. Paust, B. and R. Smith. Salmon Shark Manual. 1986. Fairbanks: University of Alaska. Weng, K.C., A. Landiera, P.C. Castilho, D.B. Holts, R.J. Schallert, J.M. Morrissette, K.J. Goldman, and B.A. Block. 2005. Warm sharks in polar seas: satellite tracking from the dorsal fins of salmon sharks. Science 310:104-106. Last modified 20-Feb-2007. Contact: Alaska Sea Grant web coordinator. This site is hosted and maintained by the Alaska Sea Grant College Program at the University of Alaska Fairbanks School of Fisheries and Ocean Sciences. NOSB photos from 2001 through 2007 on this Web site are by Hank Pennington except where otherwise credited.